Frederick George Abberline (8 January 1843 in Blandford Forum, Dorset – 10 December 1929) was a Chief Inspector for the London Metropolitan Police and a prominent police figure in the investigation into the Jack the Ripper serial killer murders of 1888. Frederick Abberline was the youngest son of Edward Abberline, a saddlemaker, sheriff's officer and clerk of the market, minor local government positions; and his wife Hannah (née Chinn). Edward Abberline died in 1849, and his widow opened a small shop and brought up her four children, Emily, Harriett, Edward and Frederick, alone. Detail from a group shot of H Division at Leman Street police station in London c.1886. Authors Wolf Vanderlinden and Donald Rumbelow tentatively identify this as Abberline. Frederick was a clockmaker until he left home to go to London, where he enlisted in the Metropolitan Police on 5 January 1863, being appointed to N Division (Islington) with the Warrant Number 43519. PC Abberline so impressed his superiors that they promoted him to Sergeant two years later on 19 August 1865. On his promotion he moved to Y Division (Highgate). Throughout 1867 he investigated Fenian activities as a plain clothes officer. He was promoted to Inspector on 10 March 1873, and three days later, on 13 March transferred to H Division in Whitechapel. On 8 April 1878 Abberline was appointed Local Inspector in charge of H Division's CID. On 26 February 1887 Abberline transferred to A Division (Whitehall), and then moved to CO Division (Central Office) at Scotland Yard on 19 November 1887, being promoted to Inspector First-Class on 9 February 1888 and to Chief Inspector on 22 December 1890. Following the murder of Mary Ann Nichols on 31 August 1888, Abberline was seconded back to Whitechapel due to his extensive experience in the area. He was placed in charge of the various detectives investigating the Ripper murders. 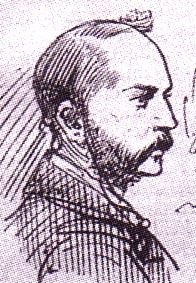 Chief Inspector Walter Dew, then a detective constable in Whitechapel's H Division in 1888, knew Abberline and, while describing him as sounding and looking like a bank manager, also stated that his knowledge of the area made him one of the most important members of the Whitechapel murder investigation team. Among the many suspects in the case, Abberline's primary suspect was Severin Antoniovich Klosowski, aka George Chapman. Among other theories he had about the murders was his theory that the murders could have been perpetrated by a female killer. Abberline was subsequently involved in the investigation of the Cleveland Street scandal in 1889. Chief Inspector Abberline retired from the police on 8 February 1892, having received 84 commendations and awards, and worked as a private enquiry agent, including three seasons at Monte Carlo, before taking over the European Agency of the Pinkerton National Detective Agency of United States, for whom he worked for 12 years. Abberline was married twice: once in March 1868 to 25-year-old Martha Mackness, the daughter of a labourer, from Elton, Northamptonshire; she died of tuberculosis two months after the marriage. On 17 December 1876 Abberline married 32-year-old Emma Beament, the daughter of a merchant, from Hoxton New Town, Shoreditch. The marriage lasted until Frederick’s death over 50 years later. They had no children. On his retirement from the Pinkerton Detective Agency in 1904 Abberline retired to Bournemouth. Abberline died on December 10, 1929, aged 86 at his home, "Estcourt", 195 Holdenhurst Road, Springbourne, Bournemouth, just under three months before his wife Emma, and was buried in Bournemouth at Wimborne Road Cemetery. In 2007, following a campaign for Abberline's unmarked grave to be recognised, and with the approval of his surviving relatives, a black granite headstone, inscribed and donated by a local stonemason, was erected on the grave where Abberline and Emma are buried. A blue plaque commemorating Abberline was unveiled at 195 Holdenhurst Road (now divided into flats) on 29 September 2001. Several fictional retellings of the events surrounding the Jack the Ripper murders have cast Abberline in a lead role. The suggestion is often but erroneously made for the sake of drama that Abberline was unmarried and formed an attachment to one of the women connected to the events. The two most popular film depictions have also cast him as an addict, for which there is no known historical basis. Abberline was played by Michael Caine in the 1988 television miniseries Jack the Ripper. In this, the character was an aging alcoholic whose quest to solve the murders gives him the strength to give up drinking. A fictionalized Abberline was featured as the protagonist of Alan Moore and Eddie Campbell's graphic novel From Hell (1991–1999), and was subsequently portrayed by Johnny Depp in the very liberal film adaptation of that work (2001). The graphic novel paints him as a sulky but sympathetic policeman, different from his peers only in his moralism and being overweight, and takes pains to include little-known details of his life such as his involvement with the Pinkerton National Detective Agency. The film's version of Abberline was portrayed as an intelligent young detective who is ahead of his time in his deductive techniques. He is also portrayed as being clairvoyant, allowing the filmmakers to ascribe to Abberline the contributions of spiritualist and psychic Robert James Lees, thus combining the two into one character and simplifying the graphic novel's narrative. Although Abberline is addicted to opium and drinks absinthe, he is a decent man who ultimately goes on a crusade against very powerful governmental and upper-class figures to stop the grotesque murders of Jack the Ripper. In the film, Abberline dies of an overdose in his late 30s; in reality, he died of natural causes aged 86. Abberline was played by Gordon Christie in the 1973 television miniseries Jack the Ripper. In "The Ripper", an episode of the television series The Collector, Abberline was played by Robert Wisden. Abberline appears as a character in the anime series Black Butler named "Fred Abberline". While he is still involved in the Jack the Ripper case, this portrayal deviates heavily from the truth, not only by altering his family history (not married but engaged and with a twin brother), but also by placing his death sometime in 1889. However, the manga version of the story (and also the musicals) depicts him like a young enthusiastic and naive Scotland Yard agent who will become the successor of Lord Randall, the actual leader of Scotland Yard. Abberline, renamed Francis Aberline, appears as a major character in The Wolfman, played by Hugo Weaving. In the Fantasy Flight Games board game, Letters from Whitechapel (2011), Frederick Abberline features as a playable policeman - in which he has a corresponding portrait (under the name 'Frederich Abberline'). His colour scheme is red. Abberline even gains a unique set of traits in the Dear Boss expansion (2017). In BBC One's Ripper Street (2012), Abberline is played by Clive Russell. In the 2015 video game Assassin's Creed Syndicate, set in 1868, a young Abberline is featured as a supporting character, helping the protagonists, Evie and Jacob Frye, capture various Templar criminals throughout London and foil a plot to assassinate Queen Victoria by main antagonist, Crawford Starrick. Additionally, in the DLC named "Jack the Ripper", set in 1888, Evie Frye helps Abberline solve a set of brutal murders committed by the infamous maniac to find her brother, Jacob. In the seventh series of the "Jago and Litefoot" science-fiction audio plays produced by Big Finish, Abberline appears as a character portrayed by Adrian Rawlins. In this story, Abberline is portrayed as having secretly captured 'Jack The Ripper', and recruits the title characters to help him in quietly recapturing the murderer after his escape. ^ Thurgood, Peter (1 April 2013). Abberline: The Man Who Hunted Jack the Ripper. History Press. p. 1992. ISBN 9780752492773. ^ "Headstone for Ripper-hunt officer". BBC News. BBC. 4 July 2007. Retrieved 5 September 2018. ^ Ryder, Stephen P.; Johnno. Schachner, Thomas, ed. "Abberline Plaque" (PDF). Casebook: Jack the Ripper. pp. 1–9. Retrieved 31 August 2015. ^ "Michael Caine in the film Jack the ripper playing the part of Inspector fred abberline". Alamy. 1 September 1998. Retrieved 5 September 2018. ^ Hill, Michael E. (16 October 1988). "Michael Caine". Washington Post. Retrieved 5 September 2018. ^ Mendelson, Scott (16 April 2010). "HuffPost Review: The Wolfman (2010)". Huffington Post. Oath Inc. Retrieved 5 September 2018. ^ Crouch, Hannah; Hill, Rose (July 24, 2017). "Who's in the Ripper Street cast? Matthew Macfadyen, Jerome Flynn, MyAnna Buring and Adam Rothenberg and others". The Sun. Retrieved February 22, 2018. ^ Betiku, Fehintola (December 27, 2012). "It will be gruesome this Christmas... Matthew Macfadyen and Jerome Flynn in first official stills for Ripper Street". Daily Mail. Retrieved February 22, 2018. This page was last edited on 14 April 2019, at 17:20 (UTC).